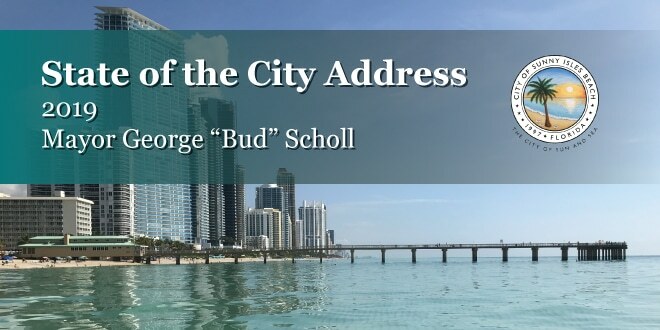 (Friday, January 25, 2019) – Citizens of Sunny Isles Beach, I am pleased to present the 2019 State of the City address. First, I would like to convey how humbled I am by your faith and confidence in the office of the Mayor, which was demonstrated by my reelection without opposition this past November. Thank you for that outcome and I promise to continue to do my best in moving our great City forward. However, nothing is accomplished individually and our City is only as strong as its people. Our residents make their voices heard, your elected officials translate those voices into a vision, and our City staff turns that vision into reality. This year I want to start my State of the City address by focusing on some of our elected officials, past and present, and some of our key City staff members. 2018 was a year of farewells. Police Chief Fred Maas retired in the summer and, due to the Chief’s cultivation of the next generation of leaders, Captain Dwight Snyder was promoted to Chief. The transition was seamless for our Police Department that turned 20 years old in 2018. Also retiring, due to term limits, Commissioners Isaac Aelion and Jeanette Gatto served their final months on the dais at the end of 2018. We wish them well and look forward to their continued participation in our community as private citizens. Sadly, we said our final farewell to former Commissioner Gerry Goodman who passed away on May 30, 2018. Gerry remained an active and respected voice in our community right up until the time of his passing. We also welcomed in two new Commissioners, Jeniffer Viscarra who ran unopposed and Alex Lama who made history by winning one of only two runoff elections in our 21 years. In December 2018, Commissioner Larisa Svechin was appointed as Vice Mayor. We congratulate them all and look forward to the next four years of working together. More recently, our City Attorney, Hans Ottinot, announced that he was leaving for the private sector. After serving over 13 years as our City Attorney, we wish him well in his new endeavors. We have accomplished a great deal in 2018 and once again, this is due in no small part to the actions of our dedicated people. Our finances remain strong with our finance department winning another financial excellence award. Tiffany Neely was promoted to finance director after the departure of our former director. Our City’s assessed taxable value increased by 1.84% from $10.9 billion to $11.1 billion with $31.4 million coming from new construction being added to the tax rolls. I am proud to report that our millage rate is the fourth lowest municipality in Miami-Dade County at 2.2 mils or $22 per $1,000 of assessed value. The City continues to carry a Hurricane/Emergency and Disaster Recovery Operating Reserve of $10 million and a Fiscal Stability Reserve of 25% of the general fund operating expenditures, which for this year is budgeted at $8.9 million. These, along with our unassigned fund balance of $6.3 million, provide for more than $25 million in fund balance. We are always hoping we can avoid disasters, however, if one strikes, we are prepared financially. Our City always has a lot of projects in progress and 2018 was no exception. One of the most visible and difficult for our residents has been the Utility Undergrounding and Streetlight Enhancement Project. After over a year of uneven road surfacing, the Florida Department of Transportation completed the Collins Avenue repaving project in 2018 and now the City has resumed the undergrounding project. All the underground conduit has been laid and the conversion for FPL lines from above ground into the new conduit has commenced at the south end of the City. This is the first step in getting all of the electrical and utility distribution lines off of the overhead poles. Simultaneously, the City is installing new decorative street lights, which started at the north end of the City. This is still a long process that will require some inconveniences to the public, but the City will benefit greatly once this work is completed. You can expect this project to continue throughout 2019 and into 2020. The Emergency Pedestrian Bridge at North Bay Road opened in February 2018 with little fanfare but tremendous appreciation. After years of controversy over the construction of the bridge, immediately upon opening, the neighborhoods on both sides were using the bridge to visit friends and family, travel to and from school, walk to the community center and Margolis Park, and also to just sit, relax and enjoy the view. With this success in mind, we identified three locations for pedestrian bridges across Collins Avenue. In 2018 we commenced on the design of a pedestrian bridge that would connect the east side with the west side of Collins Avenue at the Government Center. Walking or biking from the north or south, this location is situated to offer the best crossing to get to our most frequented city services and county services offered including our school, park, library and government center. The conceptual design is complete and 2019 will see the design finalized after satisfying all of the various federal, state and local permitting agencies requirements. Also in 2018, we launched a planning study for a bridge at the intersection of 174 Street and Collins Avenue. This bridge will be the link between the community on the west side and Samson Oceanfront Park on the east side. The study is scheduled to be completed in early 2019 with preliminary designs and permitting to follow. Our third pedestrian bridge on Collins will be integrated into a new project at the northwest corner of the intersection at westbound Sunny Isles Boulevard and Collins Avenue. The number of pedestrians that cross at this location with multi-lane turns and convergences make it a priority for enhancing pedestrian safety. Pedestrian safety has been and will continue to remain, one of our highest priorities. In 2018 our Police Department commenced new multi-faceted enforcement initiatives along our three major roadways, which have yielded very positive results. Additional pedestrian mobility improvements continue with the addition of a lighted crosswalk at 172 Street and North Bay Road. This will be completed in 2019. One of the most important amenities of our City is our beach, and in 2018 we worked on a number of projects to enlarge and enhance our namesake. Early in 2018, the U.S. Army Corps of Engineers completed a beach sand renourishment project from our northern border to 184 Street and areas both north and south of the Pier. This project, along with a private developer project completed in April 2018, brought in approximately 150,000 cubic yards of sand. Beach sand will continue to be on our project list for the next several years as the City is scheduled to receive more than 80,000 cubic yards of sand in 2019 from private development projects. In an effort to keep as much new sand in place as possible, the Army Corps of Engineers will assess the condition of submerged breakwaters in April 2019 as the City pursues the viability of a structure under the pier to maintain sand. Even our Information Technology (IT) department was busy on the beach in 2018 with the addition of free WiFi coverage along the shoreline. We are one of the few cities in the country to provide such a service. IT also provided security camera upgrades in our parks and free WiFi coverage on our community shuttle buses. Our Building Department received approval from the Florida Department of Environmental Protection to move forward with a plan to add some much-needed shade on the Pier. This project will now move forward to the design and procurement phase. In early 2018 a bill signed into law by our Governor created some concern and controversy over whether Florida beaches were private or public. After researching this bill and responding to many concerned residents, I can assure you that our property lines ensure that our beach is public to all. Our infrastructure improvements are an ongoing work in progress. The engineering design of the Golden Shores Undergrounding project will begin in 2019. The bid for the Golden Shores Pump Station renovation design will be awarded in 2019 with the work expected to commence by the end of 2019. We are systematically going through the drainage system citywide and making improvements to better prepare it for 10, 50, and even 100-year storm and flood events. These improvements include cleaning out and upgrading wells and pump stations, investigating storm drainage outflows into the bay while making improvements as needed. The Central Island drainage project is well underway with completion anticipated in early 2019. A more innovative piece of an often-misunderstood subject is our Stormwater Facility Retention Capacity Study that will analyze all of the stormwater retention areas in the City to assess capacity, adding wells, making existing wells deeper, and implementing more innovative techniques as a result of the study. As I have discussed in the past, a few years ago we embarked on the completion of a community Cultural Master Plan (CMP). Many of the goals of the CMP are being met and it continues to guide our decisions as to the events and initiatives that best meet the needs and interests of our residents. The events component included the addition of the annual fireworks show from the Pier at the City’s anniversary celebration, seasonal fishing tournaments, as well as the bridge building that was accomplished through the SIB Sand Angels event. Other events launched related to the CMP are the Gateway LIVE! performance series and the revamping of the Car Show events to incorporate a more enticing entertainment component. With the 2018 establishment of the Public Arts Advisory Committee (PAAC), which was another recommendation of the CMP, the City has tasked the PAAC with long-term projects related to creative placemaking and community bridge building. A joint workshop was held with the City Commission and the PAAC to provide a clear direction to this newly formed committee and they immediately went to task. In 2019 we can expect them to work toward the City’s first Art Park in Town Center Park. Recognizing the need for multigenerational programming, the Cultural and Community Services Department added programs for all ages such as Tai Chi for seniors, an adult basketball league, a youth recreation volleyball league and fitness program just to name a few. The City is also engaging more teens with the monthly teen only events in our parks. Finally, the community center at Gateway Park completed its approval and design phase processes in 2018. Build out will occur in 2019 and is expected to conclude by the end of the year. It will be a quality multifunctional facility, unlike any space the City owns, with socializing space as well as programming and entertaining spaces. It will be a special place and provide a central hub for our seniors for activities and socializing. As a continuation of our cultural exchanges between our sister cities, our second international intern, as part of our Sister City internship program, joined us in 2018. Karol Malamed from Punta del Este, Uruguay brought us education and experience in tourism and marketing. With a strong Latin American population of residents and visitors, Karol was able to hit the ground running. She learned and taught us a great deal in 2018 and she will continue to learn other aspects of our city government in 2019 as she finishes out her term. Our Media team has been working hard to connect our community through all media formats this year. In August 2018 they launched the SIBAlert emergency notification system, which communicates critical and time-sensitive information to all registered users. They upgraded the audio-visual system to provide closed captioning to the City Commission meetings and workshops. They also deployed a new digital system, which now allows for ease of some online registrations and forms, including the SIB Resident ID Card, film permits, and the Veterans Wall nominations. We continue to achieve new levels of reporting, accessibility and transparency, which is directly attributed to the great work of our Media team. As we all have recognized, citywide development is the economic engine that continues to provide many of the resources for creating and maintaining our quality of life in Sunny Isles Beach. In 2018 we saw three significant projects completed – the opening of the new Publix grocery store, along with the completion of the Jade Signature and Muse oceanfront condominium buildings. Significant work on the Parque Towers and the Ritz-Carlton was completed in 2018, which has both projects slated for completion in 2019. Projects that will be under construction throughout 2019 are the Turnberry Ocean Club, the Aurora, the St. Tropez office building, the Armani/Casa, and the Estates at Acqualina. Short-term vacation rentals have been a difficult issue for many buildings to manage, oftentimes eroding the quality of life in certain buildings and creating unfair competition with our hotels. After several months of studying this complex issue and receiving many complaints for our residents, in May 2018 the City Commission adopted a sweeping ordinance to regulate short-term rentals. Our preliminary research has discovered more than 2,000 unlicensed rental units out of the roughly 18,000 total condominium units within our City. Registration with the City opened in October and enforcement commenced in December 2018. To date, approximately 600 applications have been received. Early results have provided us with some solid indications that our approach to regulation is working. However, there is still much work to be done in this area. Safety in our schools became a national headline in 2018. We were reminded that we must stay vigilant in our training and proactive outreach. We continue to train our professionals on all levels of safety concerns and all City projects are evaluated from the strictest safety standpoint at the design phase for the safety of our employees and patrons. There has been a deep working relationship between our Police Department and our K-8 community school since the day it opened. This special relationship is evidenced every day by the number of our men and women in uniform assisting at the school. Given this level of dedication and diligence, we have never had an incident at our school worthy of attention – nor do we ever expect one. In addition to maintaining one of the finest police forces in Florida, our City’s continued relationship with the Miami-Dade County Fire Rescue continues to strengthen. They have increased their community outreach to improve safety and detection systems for all condo dwellers, especially the elderly and disabled. All condo managers are encouraged to take advantage of the offers by the Fire Department. We thank all our first responders for their continued dedication and service to our community. This State of the City address started with a few words about the people who live, work and serve within our great community. The multitude of activities and accomplishments described above are all possible because of the individuals involved in bringing excellence every day to the tasks at hand. I want to thank my colleagues on our City Commission, past and present, and once again welcome our newest members and wish them success. I also want to thank each and every member of our City staff who work tirelessly to turn our collective visions into reality. In the end, our community is made up of and supported by our residents and guests. Many of whom come from throughout our nation and the world bringing a culturally rich environment to our City that makes us all better people. We are all thankful for the opportunity to live in such an extraordinary place. Thank you and may God bless you.